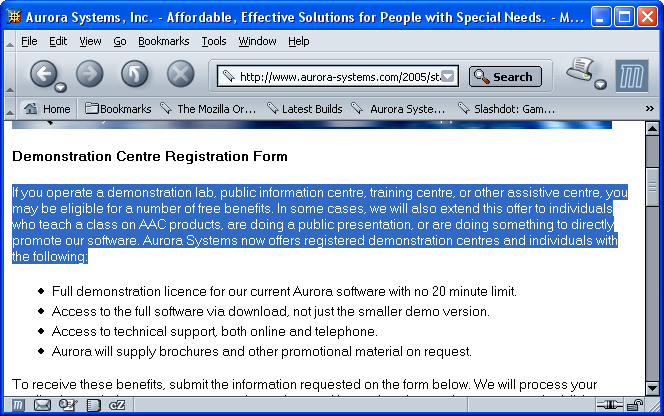 Aurora Echo provides a number of simple screenreading and readback features which are controlled by the Echo toolbar. If you feel that you don't need some of the tools on the toolbar, they can be removed or added to as you like. The "Read Marked Block" button will read aloud any section of text you mark in a word processor, web browser or email program. This is great if you need to proofread a document from someone else, or if you need help reading your email. To read the marked sentence in Mozilla below, I just mark what I want read with the mouse or keyboard, then click on the read marked block button to read it aloud. If you have trouble reading menus, icons or buttons, in most applications you can have them read to you using the "Read Button or Window" tool. This turns the mouse cursor into a screen reader, just put the mouse over the text you want to read, whether it is an icon, menu item, or dialog box, and it will be read to you. These buttons let you read back the word you have typed so far, the sentence so far, or the paragraph so far any time you like. and this one tells the synthesizer to stop speaking. If you wondered about the other tools, the wrench and lips lets you set Aurora Echo's options, the wrench and speaker let you set the speech synthesizer options, the question mark opens the online help, Computerhead tells you about Aurora Echo, and the X causes Aurora Echo to close.